It is so hard to believe this is the last week before Christmas. To keep myself cheery, bright and warm, I opted for an orange dress that I use as a long top accented with an orange scarf. Recently I love to layer pieces together to create texture and interest in my outfits. Of course, my outfit is not complete without my new Coach flat boots. After 2 hours of shopping, I officially certify this pair comfortable and stylish. In case anyone is interested, it is marked down again at Bloomingdales. I don't believe in break shoes in. Shoes should be comfortable from the start. 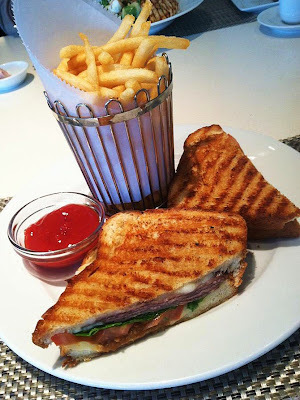 To refuel myself, I stopped for a delicious roast beef panini with fried at Mariposa, located inside Neiman Marcus. What is your favorite bright color in the winter? Are you done with holiday shopping yet? Perfect vest to go with the tangerine shirt. Good God those boots are fabulous! You are so lucky! Look like comfy and stylist at the same time! i <3 your dress! fabulous color! I love your new boots. Great find. love your fur vest! and the food looks delicious! I love the restaurant inside NM, Zodiac Room?